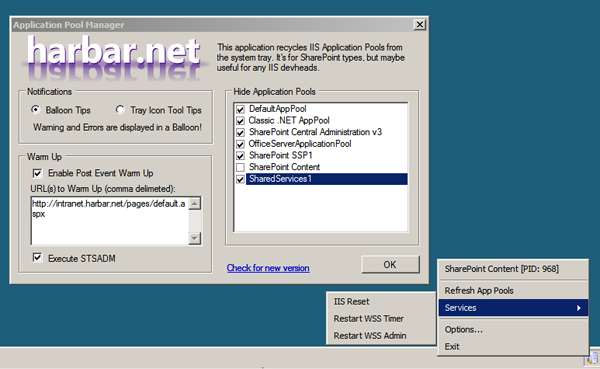 This freeware application is a System Tray utility for providing quick access to common IIS tasks which are useful on a SharePoint development box. It may also be useful to others working with IIS. In essence, it enumerates the app pools on your box and lets you right click 'em to bounce 'em! If you are experiencing problems with APM, please see the FAQ. Added Tooltip to display Process ID if an app pool has spun up. Refreshes in event of recycle. Windows 2008/Vista Support: Requires Legacy IIS WMI. Added ability to refresh the list of Application Pools. Removed dependency upon the "Warm Up" scripts. Added ability to "warm up" multiple URLs. Removed 'Recycle' tooltip which caused artifacts on Virtual Machines. Windows Server 2003 Service Pack 1 or later, or Windows Vista. 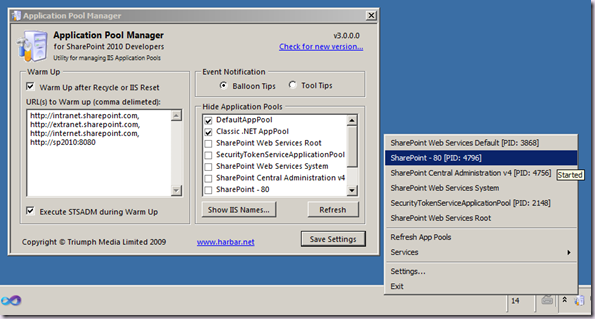 Internet Information Services 6.0 or 7.0 (with IIS6 Management Compatability installed). Enter the full URLs (including http:// , /default.aspx or /pages/default.aspx etc) in comma seperated format. Warm ups do not support HTTP 302s. There is no need to install the Warm Up scripts with this version. If you are upgrading from the previous version, remove the Path within applicationpoolmanager.config, this is no longer required. Added ability to perform an IISReset. Added ability to perform post event "Warm Ups". Windows Server 2003 Service Pack 1 or later. Instructions for configuring post event "Warm Ups". This requires the Warm Up Scripts posted by Joel Oleson. Download the ZIP file and extract the contents to a folder on your local disk (e.g. c:\warmup). 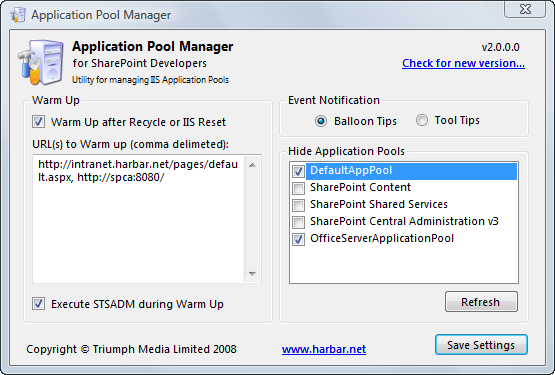 Within the Options dialog of Application Pool Manager, select the Enable Post Events Warm Up check box. In the Path to WarmUpServer.cmd text box, enter the path you extracted the scripts to. Note: do not include a trailing slash, or the filename itself. In the URL to Warm Up text box, enter the hostname you wish to warm up. Note: do not include http:// or a trailing slash. Click OK to save the configuration. 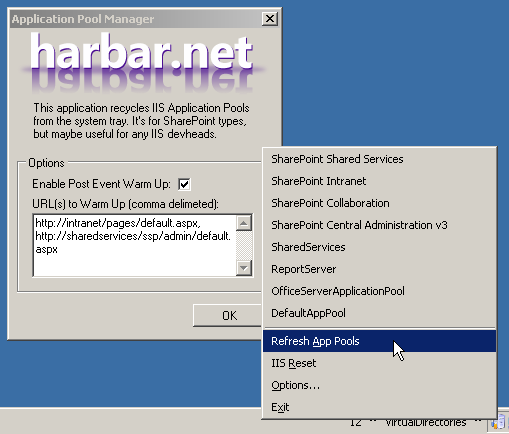 The configuration is persisted in the ApplicationPoolManager.config file. Note that the file startup.bat is redundant and not required. STSADM is run to warm up the admin interfaces by Application Pool Manager. Also there will be a delay whilst the HTTP GETs performed by WarmUpServer are executed before the final notification is displayed. 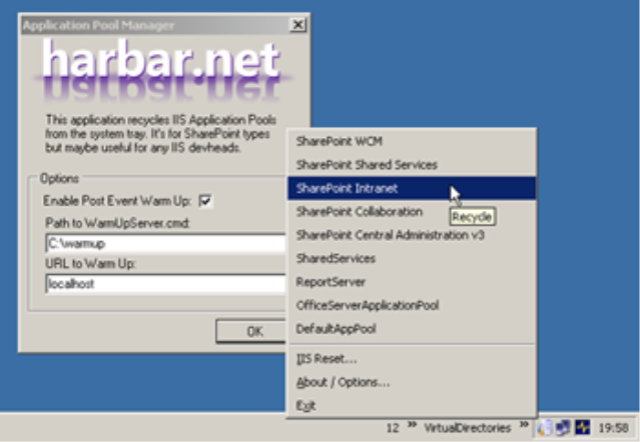 Don't forget to modify the WarmUpServer.cmd file to reference correct URLs for your SharePoint Central Administration and Shared Services Provider Administration web sites. What might get done in the next version. Allow associations between Application Pools and Warm Up Hosts. Removal of initial display of About/Options form (if I can figure out how to do that). Activate via keyboard shortcut (if I can figure out how to do that). Add keyboard shortcuts for each Application Pool displayed. Add ability to hide Application Pools (e.g. 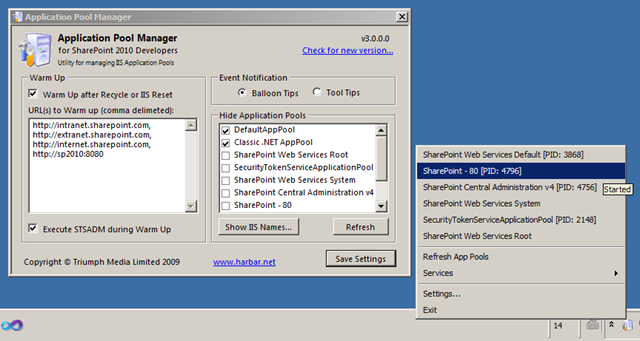 SharePoint Central Administration v3). Add Start and Stop operations. If you have feature requests, please leave a comment here. No promises! !